Sunglasses for young eyes have been reviewed by a national newspaper. The Mail on Sunday selected five models of children"s shades that it found to be among the best products available. 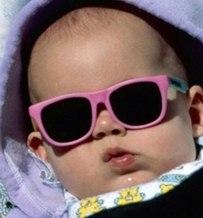 Baby Banz, at £10.75, has an adjustable strap to make sure the sunglasses stay properly on the child"s face. The design is intended for babies and children under five. Boots Soltan Kids is good for children aged three and older and has a wraparound style. Unbreakable rubber frames feature for the i kids Little Bug sunglasses, while confused youngsters who do not know which way up their glasses should go might be suited to the Julbo Looping II model. It is symmetrical and can be worn either way up. Stylish older children might go for Marks and Spencer"s Diamante Tortoiseshell Sunglasses, suitable for those who are over eight. Parents were recently advised by Candace Brault of the Examiner about symptoms that could mean their child has a sight problem. Squinting and being unable to stay focused on activities requiring close-up vision, or trouble in seeing the board at school can all be signs that a child might be short- or far-sighted and need glasses.